Our Story: The village Umaidpur has nominal facilities for co education up to the seventh grade. 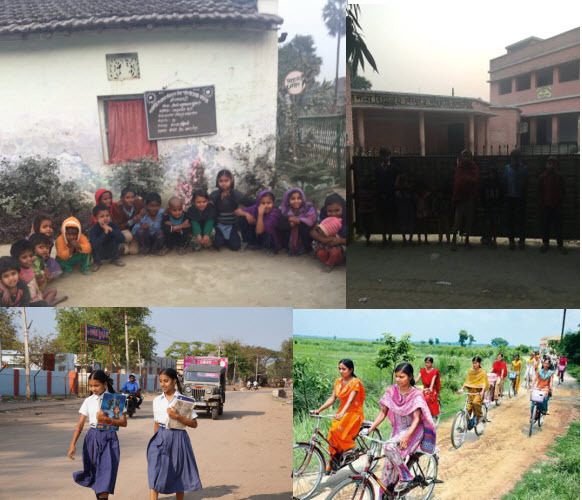 After the seventh grade, children are made to walk or bike back-and-forth to Sarairanjan (5.7 km) to continue their education till 10 grade, just as they did in 1960. There is no intercollege nearby the village; the closest one is in Tajpur (9 km) or Samastipur (17 km). Parents fear for the well being of their daughters in commuting to Sarairanjan for high school education using unreliable transportation or walking on foot. These safetyconcerns, coupled with the tight financial restraints of village families, limited opportunities for girls to receive an education. We are hoping to making this Bihar rural village Urban through developing basic urban amenities to ensure every child has a high quality education, every family a stable income and all residents enjoy good health. We invite you to join us in this work, so, together we can build a more prosperous and a caring rural community even in remote Bihar villages. The mission is to shape the future of Umaidpur उमेदपुर village by making it International Standard, where every child is empowered “To be a Change”, and instilling and empowering each individual member of the village with socio-economic and educational opportunities “To be a Change”. To achieve this goal, aspiration is to be an ISO certified ‘Model Village’ which will be self dependent and empowered with modern technologies like high speed internet, 24 hrs green electricity, highest quality education. Also building future through Economic and Social Empowerment of Women; Green Energy; Modern Agriculture Rural Infrastructure; Health, Hygiene & Sanitation Facility to all; Soil and Water Resources; and Animal Husbandry.